The final games of the Las Vegas Summer League regular season will get underway this week. We’ve got a 10-game slate on deck and we’re giving you our five favorite spreads and a reason to wager them on 888sport! The Pelicans’ top six scorers in Las Vegas are all shooting better than 50 percent from the field. That includes undrafted rookie Trevon Bluiett, who leads the league with 25.0 points on 71 percent shooting. The Pelicans have been a force offensively, averaging 100 points in two contests. That will be a recipe for success against a Pistons team that hasn’t surpassed 70 points in either of their first two games; in contrast to New Orleans, none of Detroit’s top six scorers in Las Vegas are shooting better than 41 percent from the field. Though Detroit has held its own defensively thanks to rookies Khyri Thomas and Bruce Brown, the Pelicans have too much firepower and should be in good shape for a third straight win in Sin City. This is a pretty large spread even by Summer League standards, but feel confident in the Pelicans cruising with such firepower across the board. It’ll be a battle of two of the most exciting young guards in Las Vegas as Collin Sexton battles Aaron Holiday. Holiday leads the Pacers with 16.5 points through two games, scoring in a variety of ways, while Sexton’s jumper has been pure and he’s been lethal in transition, averaging 14.5 points. The difference maker here could be Ante Zizic, who was part of the Kyrie Irving trade a year ago. He’s been a one-man wrecking crew for Cleveland, averaging 20.5 points and 12.5 rebounds in two games. The Pacers will try to counter with T.J. Leaf and Alize Johnson, but Zizic should be in line for yet another big night and help tip the scale in an evenly matched game. Indiana looked good in a win over the Spurs on Saturday but we’ll give the edge to a Cavs team that appears to be meshing well. The Hornets received some bad news with Malik Monk suffering a broken thumb that will keep him out two months and obviously the rest of Summer League. That hurts Charlotte’s chances in Las Vegas but should give Dwayne Bacon and first round pick Miles Bridges more opportunity to shine. Bacon scored 22 points in Sunday’s win over a tough Heat team, while Bridges scored 14 of his own. The Celtics are one of the more NBA-experienced teams in Vegas, but the Hornets have enough talent to hang around. Monk being sidelined has opened the doors for others to shine and Charlotte’s offense has been humming in Las Vegas. The surprise team of Las Vegas through the first few days has been the Orlando Magic. 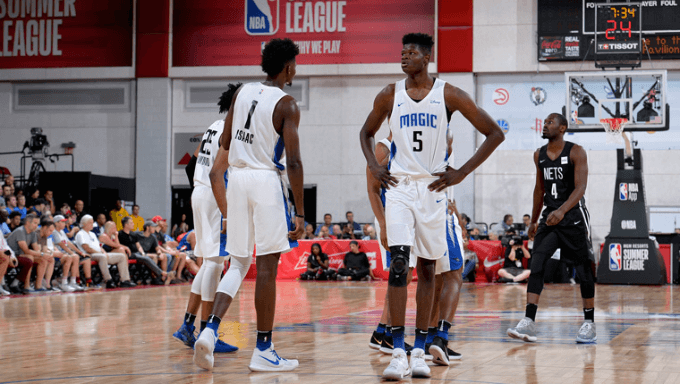 Mo Bamba (11.0 points, 63% FG, 6.0 rebounds), Jonathan Isaac (16.5 points, 7.5 rebounds) and Isaiah Briscoe (13.0 points, 3.0 assists) have helped Orlando to wins of 6 and 30 points thus far. They are playing in a back-to-back this evening against first overall pick Deandre Ayton, but you can get Bamba is champing at the bit to show who the best big man in the 2018 rookie class is. Ayton and the Suns have been good, and they have firepower in first rounds picks Ayton, Mikal Bridges, Josh Jackson (2017) and Dragan Bender (2016). This is a matchup of Vegas’ two most talented teams but we’ll give the edge to Bamba and Isaac after they smacked a Memphis team that played well in Utah last week. Consider taking them at +170 to win outright so long as their main guys are playing for a second straight night. Both these teams are back in action after impressive victories on Sunday night (Houston beating previously unbeaten Golden State, and the Clippers beating the Kings). Shai Gilgeous-Alexander has stolen the show at the point, averaging 17 points, 5 rebounds, 3 assists and 2 steals for the Clips. Sindarius Thornwell, who played in 73 NBA games a year ago, has expectedly looked great, averaging 20.0 points on 48 percent shooting. The Clippers’ other Lottery pick, Jerome Robinson, sat out Sunday’s win for rest purposes but will play this evening. He should be fresh to run in an up-tempo matchup against the Rockets and could be the difference in what will be a tight affair. We’ll give the edge to the Clippers and their mix of first-round picks playing well and NBA-experienced veterans.